“He’s really just a regular dude,” said Eugene, the interpreter trying to calm my nerves while waiting for cinematic deity Hou Hsiao-Hsien (Millennium Mambo, Flight of the Red Balloon) to finish his cigarette and join the conference call. 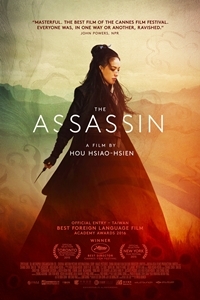 The Assassin — the story of a Ninth-Century Chinese executioner (Shu Qi) ordered to kill her former husband-to-be and the director’s first film in eight years — opens Friday exclusively at Landmark Hillcrest. Do not wait for home video! The rapturous beauty of Director Hou’s textured frames will no doubt take a hit on the small screen. If you have any interest in seeing the best picture of 2015, here’s your chance. Scott Marks: Do you remember the first film your parents took you to see and would you speak of any favorite childhood memories of going to the movies? Hou Hsiao-Hsien: I don’t remember exactly which movie I saw first, because I watched a lot of movies on my own. I remember watching my family taking us to see a horror film. My brother, who is four or five years younger than me, I remember after watching the movie — I’m fairly sure it was Frankenstein. We returned home that night. Back then we lived in a Japanese-style house. We would sleep on tatami mats, which is kind of like on the floor. I remember my brother being so frightened by the film that he woke up screaming in the middle of the night. (Laughing.) That’s a very vivid memory I have from my childhood. SM: You have said in regard to your characters, “I am always on the side of women.” My research didn’t turn up much in the way of family life. What were your parents like and how big of an impact did your mother and sister have on your siding with women? HHH: I remember — and this is important to give you a little background — when I was growing up, for a time my father worked in Taipei. Prior to coming to Taiwan and Mainland China, he was very well-educated and had very strong academic credentials. For example, when he came to Taiwan he had to serve at one point as the executive secretary to the Mayor of Taichung, a city in central Taiwan. He also worked in Taipei for a time. But because his health was not good, his body was very weak, so we had to move to the South to the Kaohsiung area where the climate and weather would be better for his body. Because of his health, he was not as busy as he used to be. I have vivid memories of him just sitting at home. He was always kind of distant. Rarely talked. And what he did talk about wasn’t much. So my memory of him was a figure always far removed from me. Sort of a distant figure. He passed away upon my graduation from elementary school. Because he passed away so early my mother had a very decisive influence on me. My mother, to give you some background, was an elementary school teacher when she lived in China. After we moved to Taiwan she still worked as a school teacher. She was actually a very strict person. Very much a disciplinarian in that sense. After my father passed, the three most important and influential people in my life were my mother, my sister, and my grandma. We all lived together, so the fact that I was surrounded by these three women must have had some kind of an effect on me. SM: I’m not sure if it’s the period or the unyielding romanticism, but for whatever reason, I find myself drawn to the opening passage of Three Times and always wanted to know where you first heard “Rain and Tears” by Aphrodite’s Child and what it was about the song that made it a perfect fit for the sequence. HHH (Laughing): Of course! I don’t recall where I heard it for the first time. I’ll tell you this as an anecdote, I was always into singing. Even as a child. When I was 13, the elementary schools in Taiwan taught you how to read the musical scales. At the time, I could pick up any songbook and just by looking at the musical notes I could sing any song that I came across. I was very interested in singing and very good at it. Chang Chen and Shu Qi in Three Times. When I was in middle school, I spent a lot of time shooting pool and hanging out in they type of environment that you see in the first section of Three Times. That’s something I did a lot of. I was also gambling. We listened to a lot of these songs while shooting pool. I must have heard the songs at the time either in a movie of from the pool hall. Both songs made a very strong impression on me. When I made Three Times, it was very natural for me to pick those songs. They made such a strong impression on me when I first heard them that it felt right for the scene. SM: Was the film shot in chronological order? If so, was there ever a point while watching the dailies where you thought even for a brief moment of shooting the entire picture in black-and-white? HHH: When we began shooting I had no idea we were going to use black-and-white. Very early on I actually considered using a Bolex camera to shoot the prologue. SM (Laughing): A hand-cranked Bolex? That old 16mm warhorse of college film classes? HHH (Laughing): That’s the one! It’s a very old-school model. No battery. It’s clock wound. When you wind it each time, I think it only allows you to shoot for something like 20 seconds. I considered shooting it hand-held. It eventually became impossible. When we were shooting in Kyoto my DP, Ping Bin Lee, is older now and his eyesight is not what it used to be. Looking through a Bolex viewfinder was very difficult for him. I had to scrap that idea. The idea of shooting the prologue in black-and-white actually came to me while I was editing. I wanted the prologue to be focused, free of distraction. Black-and-white would be a good way to distill the essence of the prologue while setting it apart from the rest of the movie. You would have to know it going to be black-and-white well in advance of the production process. In order to shoot in that style, you have to pay attention to the color of the set and costumes in order to achieve the proper color coordination. Sheu Fang-yi on the screen-widening zither. SM: The majority of the film is shot in the Academy Ratio of 1.33:1 with I think one or two shots of a character playing a zither composed for the wider 1.85:1 ratio. 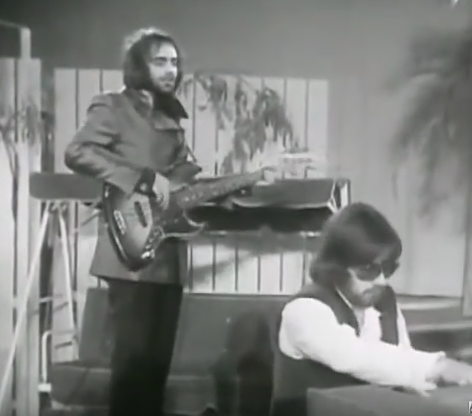 What was it about these shots that called for a momentary widening of the frame? HHH: The idea of changing the frame also occurred to me later on when I was putting the picture together. I shot the film in the standard ratio of 1.33:1, but because we were dealing with digital media, we didn’t need to shoot the soundtrack. Back then, the reason it’s called .33 is because of the space needed for the soundtrack on a film strip. Since we didn’t have to worry about that, we ended up shooting in 1.44:1, more or less the standard ratio. As you pointed out, the aspect ratio did change during the scene with the princess playing the zither. For that particular sequence, I decided to change the aspect ratio and widen the frame to accommodate the musical instrument. Otherwise the rest of the film is shot in the standard format. Nowadays thanks to digital filmmaking, during post-production you can really change the frame size to however you want it. There’s a freedom that you didn’t have back in the old days. Now that we are dealing with the digital medium I can widen or lengthen the frame if I want to. It’s almost like manga or a comic book strip. In the future, I would consider shooting a film where the aspect ratio would adjust accordingly depending on the mood or atmosphere of a given sequence. That’s the kind of freedom digital now allows us. Shu Qi stars as The Assassin. SM: When it comes to depicting hand-to-hand combat, most contemporary directors can’t resist cutting in for a series of close-ups that reduces movement to a blur. One of the first things I noticed about The Assassin — God bless you — is your disdain for placing the camera up your character’s nostrils. If anything, during one confrontation you cut across the glade to cover the action from afar. Why the intentional avoidance of close-ups? HHH: It comes down in part to a matter of personal preference. Some might have done things differently. To me, this just felt like the thing to do. Another reason I did what I did was because we were using actors that were not professional fighters, who had no experience in martial arts. These were just actors doing their own stunts. It was important for me to break things up so that we would shoot everything in bits and pieces instead of continuously shooting action. If that were a possibility...if I could have done everything in one continuous shot like I normally do with long takes, I would have done it. The actors simply were not able to do that. They needed time to train and rehearse. I would only use one camera, one angle at a time. Maybe other action films would choose multiple cameras from multiple angles, but for me it was one at a time. We kept repeating — shooting and shooting and over and over again — until we got it right. There was no need for a close-up. I wanted to keep things authentic and naturalistic. That sense of realism, that sense of continuity is very important to me. SM: The American actor James Coburn once observed, “When did pictures with action become action pictures?” I know The Assassin falls into the wuxia genre of martial arts films and as such is being promoted as HHH’s first action picture. Is this a marketing ploy to reach a wider audience or might the term “martial arts poem” be a more accurate way of selling the picture? HHH: Yes, it’s being marketed as a martial arts film, but I don’t really pay attention to that kind of promotion. When I first thought about the movie, because I know it’s about an assassin, naturally there would be action. At the same time, even though we talk about the wuxia genre, there really isn’t only one right way of doing it. As artists, we can shoot and decide whatever we want. For me, it’s important to remain true to my own vision and sensibility and make the kinds of movies that I want to make. I was never interested in having people defy gravity or fly around doing things that are unrealistic. I want to empathize and deal with human characters. SM: My only regret is being introduced to the film on DVD. I can’t wait to see how this looks on a screen. Translator Eugene and Director Hou, thank you both. And to you, Director Hou: it’s been eight years between features. Please don’t make us wait that long for the next one. HHH (In English): I will try for you and make the next film come very quickly.